On 21 and 22 May 2015, I cycled a total of 135 miles (we got lost, did a few extra, but who’s counting? Me!) 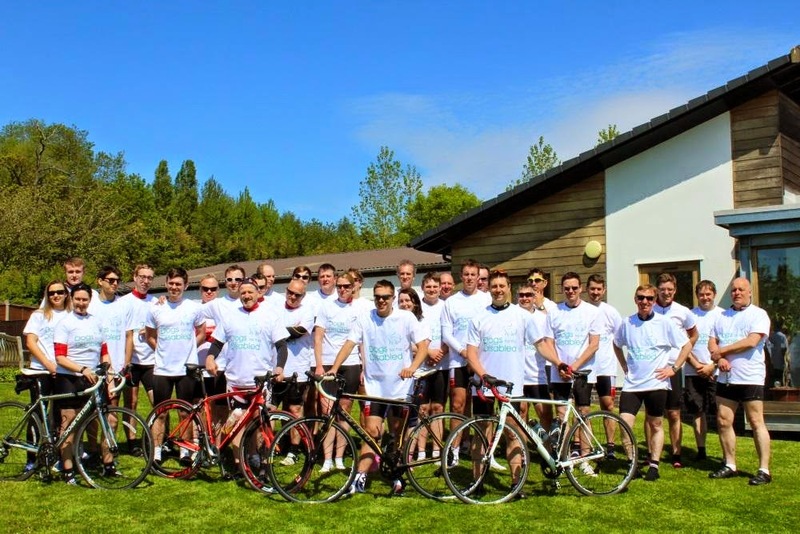 from the Birmingham office to both our London offices to raise money for Dogs for the Disabled. It was pretty epic, and very challenging. One of the hardest physical challenges I’ve undertaken just because of the sheer number of hours it took. For me, at least, it got off to a terrible start. I lost the key to my bike lock. With 20 minutes to go before the Grand Depart, I was running around desperately trying to find the keys to unlock my bike. By the time I had, everyone else was at the start line, greeting Yendal, the Dogs for the Disabled puppy who came to wave (or wag) us on our way. Photos were already being taken, cheers were already being cheered, and I was rushing out of the basement to the start line all a-fluster. When I reached the start line, I realised that (a) I only had one water bottle on my bike instead of two (I’ve never found the missing one) and (b) the one bottle I did have was empty. So then I had to run down the road to Bar Opus to get my water bottle filled. I managed to get in about two photos and then we were off. I didn’t get to speak to any colleagues or say goodbye – or even cuddle the puppy! It was not an auspicious start to the day. However, it was time for the off. And an unfortunate moment for one of the cyclists who, to the cheers and then the sniggers of the onlookers, promptly put his front wheel down a tram line and fell off his bike. At least I didn’t do that, I thought. At least I didn’t fall off. Oh, hubris, now I feel thy sting. We were off! The weather was fabulous and there were around 35 of us in an awesome-looking peloton chugging along out of Birmingham. We stuck together as much as possible but once we hit the open country, the ‘amateur elites’ as I think of them were off. Their cruising speed was probably 5mph faster than mine, so I rapidly ended up towards the rear. But that’s fine, it’s only the start of day 1. Naturally I did my best to overtake as many people as possible, which worked fine on the flat and then not so well on the hills, as they all glided back past me as I puffed and cursed up every incline. We had our first stop off in Lapworth, 15 miles in, for people to change clothes if they were too hot/cold (definitely too hot) and refill water bottles etc. And there was my dad and my nephew, come out to take some photos and cheer me on. It was ace and hopefully I didn’t look like a total newbie on his pictures. We left Lapworth to the curses of a scrap metal van driver – apparently we all needed to “get a proper fookin ride”. We all just laughed and waved at him, which I think just enraged him further but hey, there’s safety in numbers. After a further short stop at 28 miles, we ploughed on to Banbury and the HQ for Dogs for the Disabled. The weather was absolutely scorching and the ground began to undulate more alarmingly the further we rode. When we reached HQ, we all cycled through the gates as one big group for the photo opportunity and then discarded our bikes to lie on the grass in the blazing sunshine, to the drowsy accompaniment of a frantic Labrador in one of the runs who barked, roughly, once every four seconds for the hour and twenty minutes we were there. I think he was just really proud of all of our efforts thus far. After a well-earned sandwich lunch and a spot of sunbathing, we were given a demonstration by Geraldine, one of the trainers, and Upton. Upton was quite young, quite excitable, and quite new to his training. In fact, he hadn’t passed any of his exams yet. But still, he was brilliant to watch and performed nearly faultlessly, walking beside a wheelchair, sitting whenever they stopped, picking up things that had been dropped, ‘pushing’ on a disc with his paw – when he’s older he’ll use this technique to push on light switches, plugs and many more items. 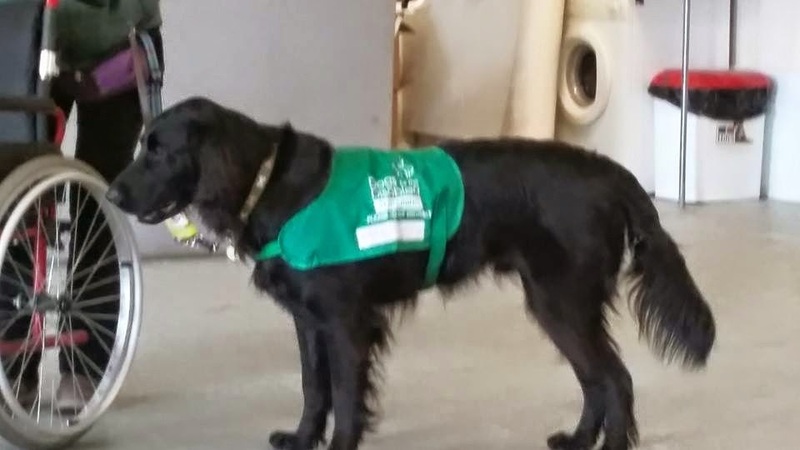 He got treats on a regular basis and his favourite green ball at the end of the demonstration, before going for a cuddle with the men in Lycra. qualified assistance dogs. They’ll then stay with one family until retirement, when a new young dog will come into the family and take over assistance duties. 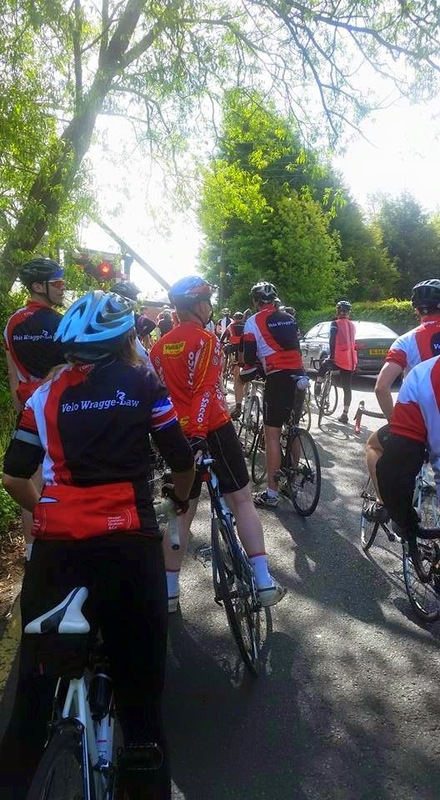 After lunch and some more photos with the charity, we set off the for the final 25 miles, beginning with 2.5 miles to Banbury train station where the Day 1 riders said goodbye and headed home. The rest of us sped off into epic sunshine and impending sunburn, heading for Thame and the Travelodge. Now, I’ve put in a fair amount of training for this challenge, but I’m nowhere near as confident, proficient or speedy as some of others. So imagine my surprise when I somehow ended up in a group of seven leading the whole Tour, with everyone else strung out behind. Wow, I thought. This is great, I thought. I’m winning! About five miles later I realised my mistake. They guys ahead were cruising, cycling two abreast and chatting, joking, pointing out the lovely scenery. I, on the other hand, was attempting not to pant out my spleen or snap a hamstring as I cycled at a speed pretty close to my top sprint speed – for 25 miles. Or, as it turned out, not 25 miles. I was getting slower, I was scoffing wine gums like they really had wine in them, anything to get energy to my legs. I was too scared to look at my heart rate monitor anymore just in case it told me I was heading rapidly towards a coronary. And despite my best efforts, the others were pulling away ahead of me. And I didn’t have a map. If I lost sight of them, I was screwed. So I kept pedalling. And pedalling. And pedalling. And then miracle of miracles, one of the guys dropped back slowly until he was with me. John Dixon. The man. The legend. John’s done all five of the firm’s bike challenges and he knew a rider in distress when he saw one. That rider was me. He kindly slotted in just ahead of me, creating a slipstream that made it easier for me to cycle. My heart rate slowly dropped out of the range of a coke-snorting rollercoaster-riding maniac. We cycled a little more slowly. I started to feel slightly more alive. Profuse thanks were gasped. And then, as is etiquette, I overtook to allow him to slipstream behind me. We had two miles to go. We’d done 73 miles, the furthest I’d ever cycled in one go. It was a lovely little village. Pretty houses. Minimal traffic. Responsible road crossing solutions with helpful humped tarmac to slow down vehicles. Or, in my case, to bounce me off-balance while looking down trying to put my water bottle back in its cage. 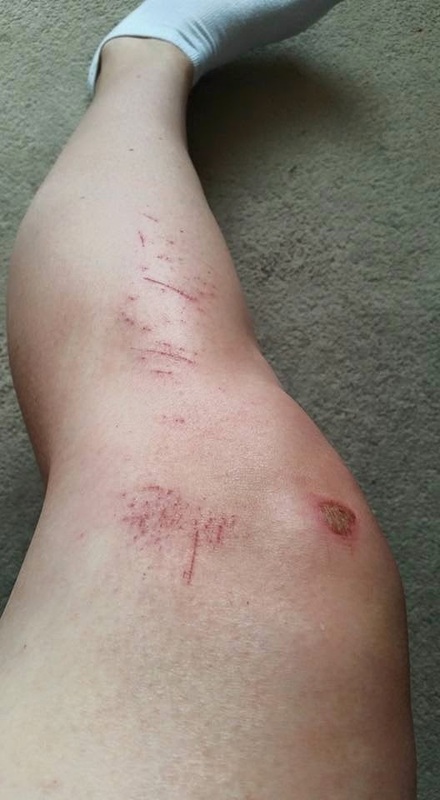 According to John, who had time to see it as he slammed on his brakes to avoid being taken out, I veered wildly left, flailed at the handlebars with the water bottle, corrected, over-corrected, and went down hard enough to slide along the pavement, helmet slapping the ground. He was off his bike and dragging mine out of the road before I had time to inhale a terrified little breath. Crap, I’ve just crashed. Really crashed. A proper crash. And actually, now that I come to think of it, I can’t breathe properly because I’ve scared myself and … ow. That hurts. So does that. And wow, that really hurts. A lady in a car stopped to see if I was alright. I flapped my hand, but I wasn’t really sure for a minute there. We sat on the kerb and John inspected me and the bike – both had minor surface damage and my gorgeous silver steed had her first scratches. I was more upset about that than the blood from my knee or the tarmac rash spreading down my leg. I was, and still am, utterly thankful for my bike helmet. Anyone who rides without a helmet is a moron. I remember my head whiplashing onto the pavement and back up and without my helmet I know for a fact I’d have been in an ambulance. John suggested it might be wise for us to take the last two miles slowly. I was happy to agree. He made a couple of adjustments on my bike as the crash had knocked my rear brakes out of alignment and we headed off. And got lost. We saw a sign saying ‘Travelodge second left’ so took the second left. It took us onto a dual carriageway. It was not the right way. We phoned the support van and found out we were a couple of miles out of our way, turned around and reached the hotel pretty quickly. A lot of the cyclists were already there. I didn’t finish in the first pack. I didn’t care. I was handed an ice-cold bottle of beer as soon as I got off my bike. It was heaven. Dinner was at the James Figg pub in Thame. Lovely pub. Lovely village. It was great getting everyone together for burger and chips and beer and water (lots of water, I was being sensible). The sense of camaraderie and achievement was very special, and everyone was in high spirits. Suntan lines were compared, sunburn exclaimed over and everyone was very concerned about my crash. Some of the cyclists decided to sample the delights of Thursday night in Thame, but most of us went back to the hotel early and tried to get some sleep. One rider, who shall remain nameless, was sharing with one of the firm’s partners and was so worried about waking him up when he stumbled in at gone 1am with his stash of crisps and Jaffa cakes that he hid in the bathroom to eat them. Day 2 was looming in a lot of minds at the Little Chef for breakfast on Friday morning. The Chiltern Hills were particularly looming. Bledlow Ridge loomed the most. John, me and a few others, having made it to breakfast early, decided to get a headstart on the rest as we knew we were fairly slow on the hills – and there were a lot of them to come. We took some photos of the map and made a note of the main roads we needed to take and set off. It was pleasant riding, once the rear ends had acclimatised to being back in the saddle and the thighs had stopped revolting and settled into a state of weary acceptance. The weather was much cooler, which was a blessing, and the pace was slower too. And yet, menacing the horizon and drawing steadily closer was a line in the distance. A line that went quite a long way up into the sky. I felt rather a lot like Frodo Baggins approaching Mount Doom. 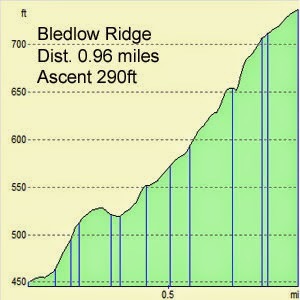 Bledlow Ridge was the biggest climb of the Tour, and definitely the steepest. I’d love to be able to say I climbed it all, but unfortunately I didn’t. I cycled about a quarter of it, stopped for a little rest, cycled some more, saw my heart rate monitor was at 186bpm and decided to walk around 60-70 metres. Then I got back on and cycled the rest. I’d say that’s pretty good going for someone who’s only been cycling for four months. There were some more hills after that, but nothing like Bledlow. The rest of the riders finally caught up with us on a long ascent just before our first stop of the day. We’d been determined to beat them to the rest stop but they just pipped us to it. From there, we had one more stop planned – at Hillingdon Football Club. Unfortunately, the place doesn’t seem to exist on GPS or Google Maps. We certainly never found it. We got horribly lost instead and apparently headed south for quite a while before we got back on course. Other groups got lost as well, and in fact I don’t think anyone actually found, or stuck to, the planned route. We were all over the place. Missing the rest stop meant we were running out of fuel and water. I was getting tired, and I was getting thirsty, and we still had a bloody long way to go. In order to get back on track it was decided to cycle the M40 roundabout. As someone who doesn’t drive, this prospect was more than a little terrifying, and it must have showed, because John Dixon stuck to my back wheel like glue and shepherded me around the scariest 60 seconds of my life. From then on it was the long, long approach to central London and the …. interesting experience of cycling in London traffic. I’d rather have cycled Bledlow Ridge again than go through some of that traffic. Red lights, manic taxis, pedestrians with death wishes, buses cutting left across your front wheel, more red lights, and more red lights. It seemed to take forever. We were all still split up, and no one had any idea where anyone else was. We knew our rendezvous was Lincoln’s Inn Fields, so imagine our surprise when we arrived and cycled all the way around the park looking for the others. There was no one there – somehow, we’d come in first. Even stranger was that within one minute of our arrival, all the other groups turned up. We’d all taken wildly different routes through London – mine included Ealing and Shepherd’s Bush and Oxford Street – yet somehow we all arrived almost exactly at the same time. Freaky. 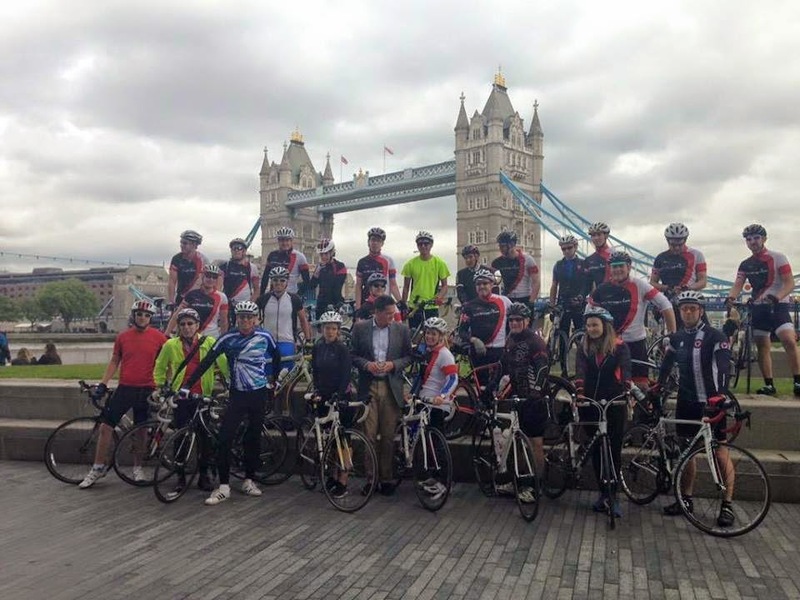 From there it was a short ride – as a group again – to Waterhouse Square and our first London destination. It was fantastic to arrive and know we’d very nearly made it. Tea, coffee, water, smoothies and lots of cake awaited us with the welcoming committee and we had some photos and a short rest before heading off to More London Riverside and our final destination. Again we all stuck together on the four mile ride to the Thames, and I have to say, crossing Tower Bridge with 30-odd other cyclists felt absolutely incredible. That was the highlight for me, even more than sweeping through Potter’s Field to the finish line for photos and a well-earned hot buffet with beer. One final task awaited us – cycling back through rush hour to Marylebone station. Now it’s only four miles away – again – but we were advised to leave at 5pm for a 6.15pm train. Ridiculous, I thought. Crazy. What was crazy was the traffic. The people. The buses. The cyclist commuters who were more dangerous than the buses and gave us just as much hassle. We made it with five minutes to spare. All in all, it was a hell of an experience, and one I’m thrilled to have completed. I’m extremely pleased now that I put in all those hours and miles of training, as I’d never have done it otherwise. But it’s all about the doggies. 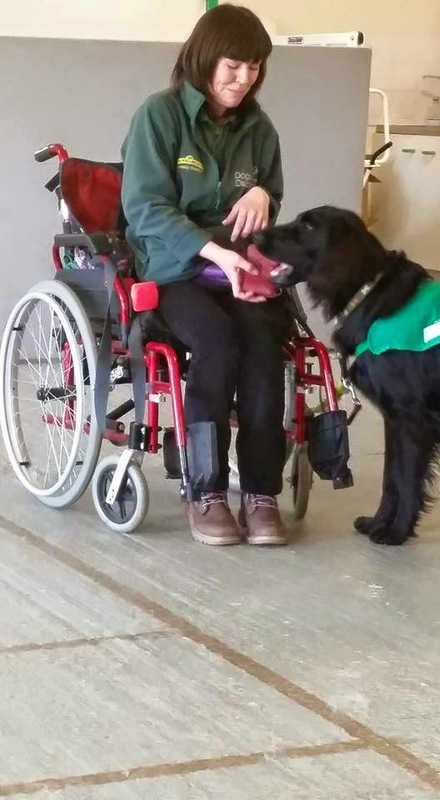 Dogs for the Disabled is a worthy charity and deserves all our support. And for now, and until next year …. Allez allez allez!